Evan and I flew to Invercargill from Wellington & were kindly collected by the Brunton’s of Te Anau. The weather was pox in coastal Fiordland, so no flying that day. The Fiordland Mountains create interesting weather patterns, with weather on the west normally opposite to that on the east. In sunshine we sat and repacked, knowing that the Wx over the Divide was poor but clearing. We managed a helicopter charter first thing, but the route wasn’t clear of cloud and we had to look at a few mountain passes before making it over one (waypoint 8 on google maps). The Edith River, our destination, lies within the Glaisnock Wilderness Area, which means that there will never be any huts or tracks in here, and helicopters must only land at the high tide mark. Hence, any travel is by shank’s pony, and no food drops are allowed, hence the 31kg (70lb) packs full with 14 days food, equipment and camera gear. When landing straight into remote wilderness from civilisation like this always creates a little shock to the system, and this was no different as we stood looking up at the sheer mountains above. Fiordland was carved from rock by glaciers, so valley profiles are U-shaped; flat floored, but with very steep sides. The wapiti deer were rutting at the moment, so the plan was to climb high and glass with binoculars as long as the weather held out. We headed for a side valley, with a steep climb in. The crux was an almost impassable gorge at the entrance that took a couple of hours to figure out how to get past, at one point finding a spot we could climb down into the mossy green chasm, cross, climb out and sidle, trying the other side. A 20 metre drop down a greasy ferny rock face saw us into the hanging valley. That evening we heard our first bugle coming from a region near the bottom of a tree avalanche zone (yes, tree avalanches…a feature of Fiordland’s steep valley walls are the avalanching clean of the rock walls as the weight of trees increases to where it can’t hold itself, and life starts off again forming from lichen to mosses to ferns to shrubs to trees to crash, and so on and so on…). A young wapiti bull had his territory here and we got some great photos. He clearly had not seen a human before and remained nervously for 18 minutes, at times so close I had to walk backwards to get him in the frame! We were with him until dark – fantastic experience, and one that pushed the photographic limits (like 300mm lens, f4, 1/4sec at 3200asa), and I got some beauties. Afterwards it yielded the best campsite we’d seen for the day, being relatively dry and flat – both rare commodities here in one of the highest rainfall areas in the world. Evan set off for water and I pitched the tent. Soon we were fed and drifting off to sleep with the odd deer roaring in the distance (Waypoints 17-23). Next day we climbed to the Wapiti River Saddle, seeing a nice young wapiti earlier, and put the tent just under the saddle in a nice stand of beech trees. The Wx looked to be holding for another day and we aimed to poke our binos into a small basin high above the Edith River. We climbed high and despite seeing no deer we saw a few seldom seen native rock wrens. These tiny little birds live in the harshest environment, and also have introduced predators to contend with. Little wonder their numbers are falling. . Waypoint # 65. Following a bit of a hairy climb we crested into the basin with high expectations, but alas, nothing worthy of the shutter was found, other than the basin itself. Heading home was a beautiful evening with sun raking across the saddle below us (see photo below – click for large). Wind was picking up, a sure sign of weather on the change. The HF frequency mountain radio (our only contact with the outside world) each night gave us a weather forecast and confirmed our location. It advised poor weather ahead so we plotted a hurried exit to cross the main Edith River before rain set in making it impassable. Next day, we packed camp before heading down valley to investigate a wapiti bull we’d heard roaring away. Sneaking in towards him we completely underestimated his proximity and the game was up before we’d even moved into stealth mode – no photos of this boy or the wapiti cows in attendance. Lunch further on wasn’t a terribly exciting affair, about 6 crackers each with salami and cheese made our daily staple. The thing about carrying everything you need for 14 days on your back through tough tangled forest is that you enjoy everything in a fresh new way. For instance, our daily ration of biscuits, one of only several ‘luxury’ items (like a small amount of chocolate, and a few coffee bags; read ‘methadone’ since my Vibiemme Domobar was pining back at home) , was two gingernuts each per day. At home I’d normally eat 2 before the tea had brewed, and not even taste them. Here luxuries were luxuries and we both developed new ways to be fully present to them. So lunch made a good break before a major obstacle. We had to find a route to climb out of our hanging valley. A mossy green dark frothing chasm formed the streams outlet surrounded by high cliffs which created a difficult cirque. We’d had trouble finding a route in, as there were no obvious game trails, and had made a controlled slide down a mossy rock wall so getting out was going to be harder. Moir’s guidebook suggested a climb out on the true right which we tried. This ended up being a 50m vertical climb up through moss covered cliffs hanging off tree trunks. Not for the faint hearted, but do-able. From here it was a steep descent to the main river down the side of the waterfall, where we stripped off and jumped into the cold autumn waters for a deserved wash (waypoint 88). Sandflies kept their distance just long enough for the tiny block of soap to do its job. A quick snack and a last glass for animals before the sun disappeared (not to reappear for 6 days). With darkness looming we headed down river as far a possible to the base of tomorrow’s climb, seeing a few rare native Blue ducks on the river; one pair that still had a fully grown juvenile in tow. They will be trying to push this out of home before winter sets in and food becomes harder to find. Blue ducks are NZ’s only torrent duck, and I believe the only duck in the world to have fleshy lips. Check out the ‘lips’ photo taken while working on this book about Blue Ducks. We were lucky to find a flat dry campsite beside the river. Fiordland rivers have a very fast flood rise time (the super high rainfall here drains fast as it is already saturated and there is little soil to retain it) as soon as it starts raining, and they rise very high. Camping in places like this means you have to be mindful of an escape route should rain get heavy in the night. Fortunately the predicted rain laden front was a day away so we slept well with only a small eye on the heavens. Just before dawn we woke, turning on head torches to start breakfast and packing before dawn and were startled by a loud guttural alarm bark of a Wapiti close by! An animal had been feeding on a grassy flat about 20m from the tent, and our lights had startled it. Good start to the day we thought, downing cold muesli (granola to some), a gulp or two of hot tea, dropped camp and we were off into the forest to beat the bad weather to the tops. Our route was straight up a steep little ridge in the bush, with the odd deer roar in the distance. We crested out onto a flat swamp 250 metres up, before pulling compass & altimeter out to pick a zig-zag sidling route across the flanks of the steep valley walls. Initial attempts to gain height was frustratingly thwarted by bluffs which repeatedly forced us back down and around, before we picked up a faint wapiti trail. Life is much better on a wapiti trail was again the motto of the day, and every attempt was made to stay on it because of the precarious country we were now in. About 5 hours later we started to peek out through thinning bush as we gained altitude, before dropping again down into a primeval forest filled basin reminiscent of the Lord of the Rings movie. The last two hours saw us push right up into the alpine tussock and the search for a campsite began. Nearby a fantastic hanging valley contained a spectacular lake, at the head of which we glimpsed several Wapiti feeding just as the weather broke and we set about establishing camp knowing that the weather was about to give us a pounding for at least 2 days. We were lucky in the spot we found. The 2 days turned into 5 days held prisoner with 100+km/h gales, torrential rain, hail and snow. Our small HF mountain radio brought dire forecasts every night and it went on and on. We listened to other parties in the mountains and many were bailing out and going home because of the weather. We heard a couple of guys on the radio in the Nitz Valley claim it was as big as the Clutha River, and they ended up being rescued by chopper! Last time I was in the Nitz I got across with dry feet. So, our original plan to walk the length of the Edith, over Edith Saddle and down the Glaisnock River to catch a boat home was increasingly unlikely. We were effectively stuck as the rainfall and swollen rivers meant that we couldn’t move very far should we have wanted to, and the snow was making dodgy bluffs more treacherous. So, we were stuck in a small tent, with no book, or iPod (whatever), for five days, sneaking out only to get water, or answer the calls of nature in my Swazi Jewel bags…Brrrr!. How many people these days get to spend 5 days in one spot with little comforts, let alone 14 days in tough country without any civilisation? It’s a rare chance to be alone with your own mind, a condition that I suspect many folks are scared to experience these days? Most people we’ve spoken to about this just can’t understand it, but if you’ve been there and done it you’ll understand the experience. I can only describe it as living totally in the present, and boredom doesn’t have a chance to take hold when life revolves around shelter and food. On the fifth day the weather started to break and you can’t imagine what it was like to head out and stretch the legs. The weather had changed to the south, got cold but fine as the southern mountains created a barrier, allowing the odd snow showers to sneak through. We’d go from sunny to blizzard every 1/2 hour. Here’s a typical scene looking down to Lake Alice. We travelled along the ridge seeing several wapiti animals and catching up with a large antlered hybrid bull. The article about this will be published in Rod and Rifle Magazine in June so you’ll have to hang out for that, but what entailed was a tough day getting down to him via some very dodgy snow covered bluffs and getting back to camp well after dark as the snow started falling and blanketing everything white in the full moonlight. Spectacular but very cold and damp. Next day was the first bit of sun we’d seen for a while. Everything slowly gets damp in the tent from ‘blow through’ (when torrential Fiordland rain hits the outer fabric of any tent it will always create a small amount of mist punched through the fabric), or condensation. So when we got the chance to dry stuff it was beaut. The photo below says it all – as if a bomb had gone off! The peaks behind were where we climbed the day before. In the afternoon we took off to climb a prominent peak high above camp. We spotted several wapiti enroute and got some nice shots. From the top we had spectacular views over the wapiti country. The weather was superb and the sunset was a beaut so we stayed until dark. This was our last evening in the area, and as Evan said “we’ve had the worst weather on this trip, but this one evening makes up for it all”, and I had to agree. The full moon came out and the dew started forming – it was going to be a cold frosty night. We’d arranged for the chopper to pick us up the following evening from the edge of the wilderness area. The following day we headed down in fine weather to Lake Alice at a leisurely pace. Arriving in time to explore down to the lake and surrounds. Late in the day we heard our first anthropogenic (human) noises in days as the Hughes 500 helicopter arrived. Before long we were airborne. Again the weather on the divide was tricky and we ended up spending an hour flying through some of the most wonderful scenery looking for a clear mountain pass to fly over into the eastern side of the ranges. Can’t complain about that sightseeing! Back in civilisation we enjoyed hot showers, comfy chairs, catching up on 2weeks news, and a wonderful home cooked roast beef meal. It was great to be home and start the processing of hundresd of images for my stock image library. Thanks must go to the hard work of the Fiordland Wapiti Foundation. Always nice to read a positive story from someone who enjoyes the area for what it is, and not worrying what it is not. Look forward to your story in R&R. Thanks for the comment re the Fiordland Wapiti Foundation. You would almost think we were the foe in Fiordland. Going by the web chat line. But we do no they are the minority. Things going well with the animal recovery just started to remove some of those big body wapiti with very small heads. As of yesterday our telly of animals recovered for the year is well over 900 well on the way to target of 950 with a month to go. Actually, just found out the side valley we climbed into at the start with the cliff entry & exit is called ‘Impossible Creek’…little wonder! Found your site from doing a Google search of Lake Alice as am thinking of doing the same trip in Dec/Jan. I was in the Cozette Burn same timing as yourself, the weather hit hard, it was a humbling experience. Enjoying your site, thanks. Can I ask what camera gear you would take on a trip like that and what precautions you would take to protect the body etc. It must be quite an extra load to lug around a digital SLR body around in Fiordland.. Cheers for the Great read.. Thanks Rob. Yip, it certainly makes the pack a lot heavier as you can read with the 31kg pack. Being stong and fit is vital. This trip I left the Canon 1DsMk3 at home – too heavy and large. Took a Canon 5D, a fixed 24mm lens, fixed 50mm lens, fixed 300mm and canon 2x converter, plus canon flash and cord. I don’t really take much precaution as high end SLR’s are pretty robust. 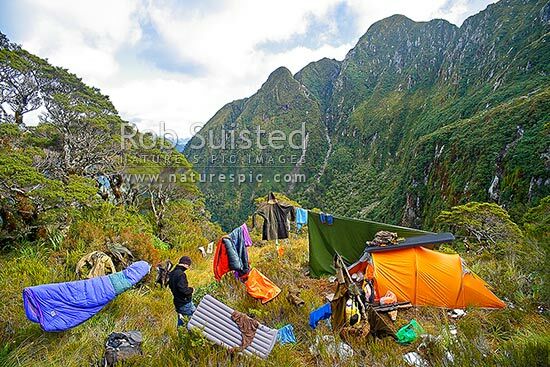 In saying that though, always watch out for big temperature changes in a high humidity area like Fiordland – like in and out of tents. For instance, a cold camera will condense water vapour quickly if you suddenly take it into a warm tent, and that damp gets right through the camera. Also, padded camera bags tend to insulate like chilly bins and can increase this problem if you’re not wary. Other than that, the key is to have the gear ready as you’ll need it when you don’t expect it and you won’t have time to fluff. Brilliant you’re still out doing this Rob. Loving your work. Rob, your ‘Wally’s Found’ was fab read, best photos. Absolutely goregous. Takes me home, feels so good. Kiwi by birth, big OE at 20yrs, now married in England. Visiting Fiordland Feb 2010, to find Lake Bloxham (named after my father), Dorizac falls (after his friend) in Murchison Mountains, trying to get permit from DOC. You’ve given me a good view of what to expect. Wow! Full of respect! Now 52yrs – do you think its possible. In training. Hi Vicky. Thanks for the compliments. Great trip you’ve got planned. I’ve searched my Moir’s guidebooks versions (1959 / 1979 & 1995) and no info for this area. Took a look at the topo map and to my eye looks pretty straightforward as far as Fiordland can go, so yes, I’d say it’s totally do-able. Once you’re at the outlet of the lake though you haven’t got too much option for exploration by the look of it though, but you’d probably be able to pick your way around the northern side if you were keen. Keep us posted – I’d be interested to see some piccies. Very interesting and great story in R & R, congratulations on your trophy. Myself and three others have been fortuitous to draw the Edith for the 1st period and I am currently compiling info about the block, best routes, etc. Any chance I can contact you directly to talk about your experience and any advice you have, directions, etc? Any info would be greatly appreciated. Very enjoyable read, beautiful photo’s, have drawn the George River Block and have enjoyed the photo’s you have on your site, Any info on this block wonder be appreciated. You're reading Wally’s found! 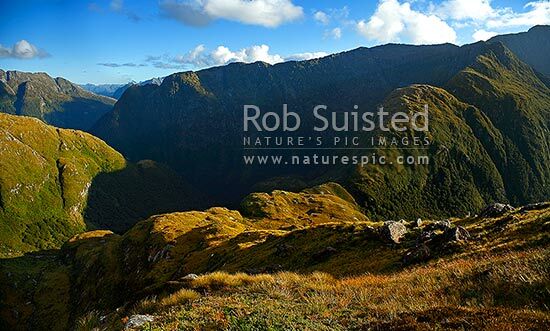 Fiordland 2009 Expedition Report at Nature’s Pic Images Blog.